National Salute to America’s Heroes presented by Hyundai is a patriotic two-day event Memorial Day weekend designed to pay tribute, honor and encourage military and first responders. The National Salute to America’s Heroes presented by Hyundai is anchored by the Hyundai Air & Sea Show and includes the Music Explosion presented by Hyundai, both of which combine to make an experience that combines The Greatest Show Above the EarthTMwith a concert on the sands of South Beach and countless interactive displays. The U.S. Navy Flight Demonstration Squadron, the Blue Angels, will headline The Hyundai Air & Sea Show over the oceanfront in Miami Beach. The family-friendly event has something for everyone. EVENTS: The National Salute to America’s Heroes presented by Hyundai debuted in 2017 along the shores of Miami Beach to a daily crowd of more than 100,000 spectators. The 2019 event is expected to be even more exciting with larger spectator viewing areas spanning from 11th to 14th Streets along Ocean Drive. 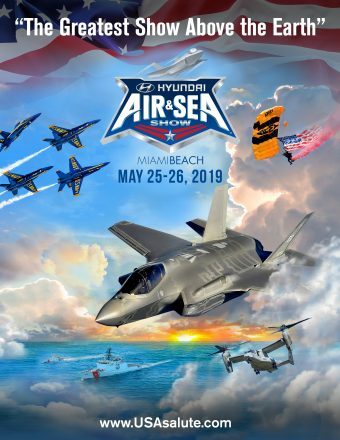 The Hyundai Air & Sea Show has more military equipment than in the past two years and The Greatest Show Above the EarthTM is certain to please veterans, patriotic Americans and air-show aficionados. Packed with action in the sky and on the water, the Hyundai Air & Sea Show will have crowds cheering from 11thto 14th Streets along the shores of Miami Beach. LOCATION: The National Salute to America’s Heroes takes place on Miami Beach. The free to the public Display Village, Action Zone, and Kids Zone are located between 11th and 14th Streets and includes interactive displays from military service branches and corporate partners. Additionally, the Action Zone includes the STIHL Timberworks Lumberjack Show and the Monster Energy Keith Sayers KSFMX Freestyle Motocross demo team. There is no shortage of engaging activities for fans. The National Salute to America’s Heroes presented by Hyundai is a nation-wide two-day celebration held on Miami Beach, Florida featuring the Hyundai Air & Sea Show, Music Explosion presented by Hyundai, and Salute 365 initiative. Held Memorial Day Weekend, the National Salute to America’s Heroes presented by Hyundai focuses on honoring and paying tribute to the military and first responders who protect the freedoms of all Americans. For more information, please visit, www.USAsalute.com and to view the promotional video, please visit National Salute to America’s Heroes created to showcase the purpose, scope, and magnitude of the National Salute to America’s Heroes project.